avec la contribution d’Olivier Baisnée, Ludivine Balland et Sandra Vera Zambrano. In recent years, the Leveson Inquiry in Great Britain, as well as the EU High-Level Group on Media Freedom and Pluralism, have stirred heated debates about media accountability and media self-regulation across Europe. How responsible are journalists ? How well-developed are infrastructures of media self-regulation in the different European countries ? How much commitment to media accountability is there in the media industry – and how actively do media users become involved in the process of media criticism via social media ? 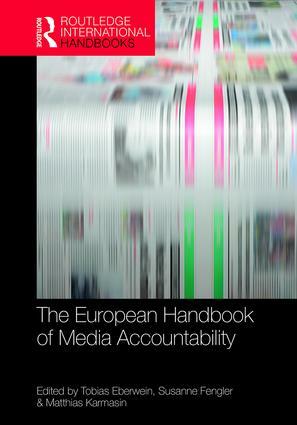 With contributions from leading scholars in the field of journalism and mass communication, this handbook brings together reports on the status quo of media accountability in all EU members states as well as key countries close to Europe, such as Turkey and Israel. Each chapter provides an up-to-date overview of media accountability structures as well as a synopsis of relevant research, exploring the role of media accountability instruments in each national setting, including both media self-regulation (such as codes of ethics, press councils, ombudspersons) and new instruments that involve audiences and stakeholder groups (such as media blogs and user comment systems).